Our unique bath and body products are inspired by nature to help give you beautiful, healthy skin while delighting your senses! 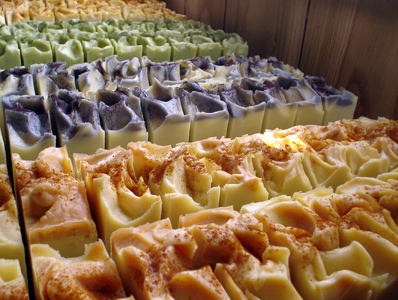 All of our products are handmade and crafted by our founder, Kathy Jones - she's been making her unique style of soaps since early 2002, and still makes all of them in small batches to ensure the utmost quality each and every time. To create our natural, fragrant, skin loving, luxurious products, we use only the earth's finest natural ingredients from the botanical world - cold pressed vegetable and plant oils, nourishing plant butters, pure essential oils, various botanicals and we achieve our gorgeous colours using natural clays, minerals, oxides, herbs, and spices. Please Note: Soap makers in Australia need to be registered with the Government Department of Health, via NICNAS, in order to sell their handmade soap legally. For your peace of mind our license number is No#9218. Please ask soap makers to give you their license number, or to show you their certificate, so you can rest assured they are following the correct rules and regulations. We invite you to have a look through the many natural care products we make, and start pampering your skin - naturally :) Come back often as we're constantly adding our newest creations!